What are you focusing your STEM Impact Plan work on for the coming year? This year, our STEM Impact Plan includes personal proficiency in our development of curriculum-aligned STEM lessons in our classroom along with providing support and guidance for our faculty. We have established a STEM common language and are preparing to add needed resources to support stimulating STEM lessons. One of our points of focus in the second semester will be mentoring our faculty in preparation for aligning our 5-8 curriculum with an intentional STEM plan. What exciting STEM experiences do you have planned? Annunciation is thankful to the Air Force Association Civil Air Patrol’s generous grant of a professional weather station that invites students to participate as local meteorologists, collecting and sharing data with our local news station and Weather Underground. Students take turns to collect data daily in sixth grade and share data through an online connection. A local meteorologist will visit to talk about his STEM career as well as give a hurricane presentation in December. The Invention Convention was a great success as seventh-grade students researched, created, and presented an original or improved invention. 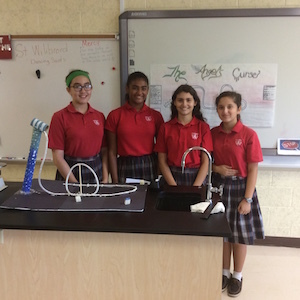 Eighth-grade students explored physical science by engineering 3D models of roller coasters. Students began with the basics of measuring speed and acceleration, defended the Laws of Newton and Conservation of Energy, and discussed the layout of a new roller coaster in a theme park. They moved into the mechanics of materials to create 3D models of their design and are finishing up with a simple business plan presentation for industry professionals from Universal Studios. Holy Family is thankful to the Northeast Florida Astronomical Society for bringing their powerful telescopes to our school. Our Holy Family Astronomical Society (HoFAS) members were able to view planets and stars up close. 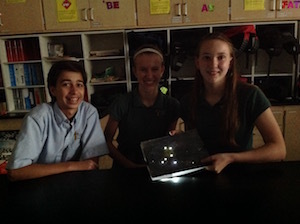 It was a great introduction to our eighth-grade project on constellations. In this project, students used a small copy of a chosen constellation to design a scaled model of the constellation and major elements of the galaxy. Then they used LED stickers, copper tape, and 3V batteries to build a parallel electrical circuit to connect all the stars. While working on the constellations, students wrote a research paper about their chosen constellation during their English class. They read books about the mythology associated with their constellations during literature class. The seventh-grade classes were introduced to the engineering design process through the STEM project, "If I were a structural engineer, how would I help the three little pigs?" The students used everyday technology to design a house for the three little pigs so when the wolf huffs and puffs, he cannot blow the house down. A structural engineer from the Haskell Company was our guest speaker for this project. Fifth-grade math is working on a STEM project called Euclid’s Brownies. This project is designed around volume. The students are using the engineering design process to design and construct a box to contain 24 brownies, which will be mailed to New Jersey and California. They are stepping up to the challenge and thinking outside the box. No pun intended! In what ways have you been able to engage other members of your school, local community, or other STEM Teaching Fellows? We have engaged other members of our school and local community in a variety of ways. We surveyed our stakeholders, and we are sharing the great STEM happenings through newsletters, student work, parish bulletins, and Facebook pages. Students in sixth and eighth grades in both schools are flexing their STEM skills with sensational science fair projects that will be entered in the Diocesan Science Fair in January as well as the Northeast Florida Regional and Engineering Fair in February. ACS faculty has been busy integrating great lessons. Kindergarten engineered haunted house models and third grade celebrated fall with pumpkin catapults. Second grade joined eighth grade to explore Newton’s Laws and energy with roller coasters. 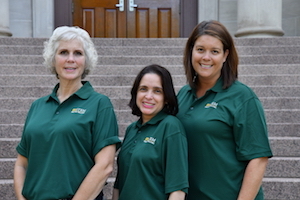 Holy Family has developed STEM-integrated unit projects through the school buddy system. Kindergarten will join seventh grade before the Christmas break to explore butterflies and moths. 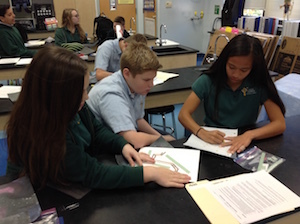 Our eighth-grade students will share their constellation projects with their second-grade buddies after Christmas. They will lead their buddies in designing constellations with everyday materials.